People Love Art Museums — But Has The Art Itself Become Irrelevant? Don't be fooled by museums' strong attendance numbers, says professor Michael Lewis. He argues today's art world is a Potemkin village, whose gleaming facades mask an indifference for the art itself. 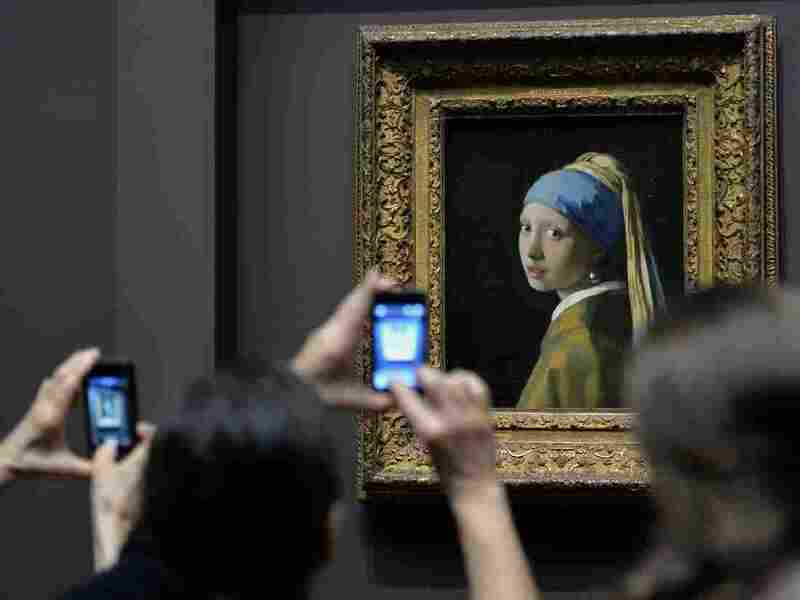 Vermeer's Girl with a Pearl Earring stares back at cellphones at the Frick Collection in New York City. "The art museum used to offer objects, works of art, the finest that we have," Lewis says. "And it's gone from offering objects to offering an experience." How much is a visible work of genius worth? In May, a 1955 painting by Pablo Picasso was sold at auction for more than $179 million, the highest price at auction ever. And attendance at major art museums is booming. "The art world has never been healthier, if you measure the intensity of the human experience of what art has to offer," says Michael Lewis, an art history professor at Williams College. "Glistening new buildings everywhere and the great rise in the subsidiary parts of art museums — the cafe and gift shops — there's no question that there's a great allure in the museum world today." There's a but, of course. In the current issue of Commentary Magazine, Lewis argues that we shouldn't be fooled by the gleaming appearance of the art world today. He tells NPR's Scott Simon that most Americans have in fact become indifferent to art. "Behind the high attendance figures and the high auction prices, things are going badly," he argues. The week I was asked to write the [Commentary] piece was the same week that we introduced to our introductory class the career of the performance artist Christopher Burden. He's the fellow who achieved fame in 1971 by having a friend shoot him through the arm as a performance. And what struck me, when we showed it, was that my students refused to judge it. They were intrigued by it; I could see from many of their faces that many were horrified. But it's a sign of our times that when they were asked to speak about it, they dealt with questions of legal liability ("Did his friend sign a release to do that? "), but not one of them expressed a human emotion of revulsion, that this is a horrible thing — why did he do it? It occurred to me that this is not good for art. The art world can survive anything from the public — hostility, ignorance, even fanatical prudishness — but the art world cannot survive an indifferent public. There's the critical moment: 1978. I was in college at the time. It was the King Tut exhibit at the Met: 1.8 million people lined up to see that show. And that got the attention of the administrators — not just of the Met but the trustees of every museum in the country. This hadn't happened before. Museums tended to be dowdy places run by superannuated financiers who every year would write a personal check to cover the deficit. They suddenly realized that, well, "I don't have to cover the deficit if you can produce more of these blockbuster exhibits." I actually talk about this in the piece. It was almost 20 years to the day, 20 years after The Treasures of Tutankhamun, the Guggenheim did The Art of the Motorcycle. And it was equally thrilling, equally successful, but it tells us that our society can no longer distinguish — effectively distinguish — between a Harley-Davidson Sportster and a 3,000-year-old golden mask from Egyptian New Kingdom, can't make a qualitative judgment about intrinsic value. So, the museum seemed to be more and more successful, but there's been a little bit of a cultural bait-and-switch that's going on behind the doors of many. Really, it was the great breakthrough of [architect] Frank Gehry's Guggenheim Museum in Bilbao, Spain. And what that showed, if you picked a remote part of the world and put a world-class museum in it, the world would beat a path to your door. That's the so-called "Bilbao Effect," but you'll notice that doesn't mention art; it mentions tourism, travel and finance. I feel we're in a strange time where we're building furious Potemkin villages of seeming life, behind which, if you looked with the right eyes, you would see cobwebs and skeletons.